The boys desperately needed some pajama shorts, especially for days when pajama wear turns into daytime wear. I had my little one try to pick fabric he liked, but I don’t have much boyish stuff. Then I came across my pillowcase collection and there were a few that I thought would work. The best part about using pillowcases, is that you can take advantage of the hem and, in some cases the side seams, which means less sewing. YAY! I thought I’d share with you how I made these. They are very simple and easy to adjust sizes. Depending on the pillowcase, you can make almost any child’s size. First, you’ll need a few measurements. The waist, side seam length (I measured from hip to knee for longer shorts) and the rise (from crotch to belly button). Using the side seam length measurement, add 1.5 inches for elastic waist casing. 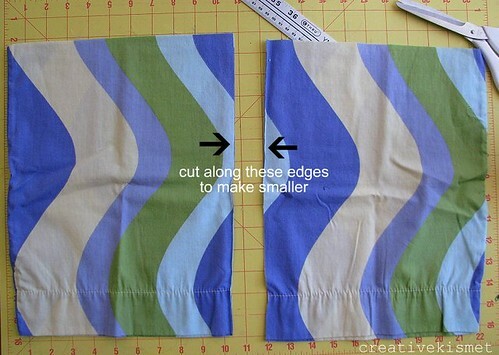 Lay pillowcase flat and cut a piece using that measurement, keeping pillowcase side seams and hem intact. 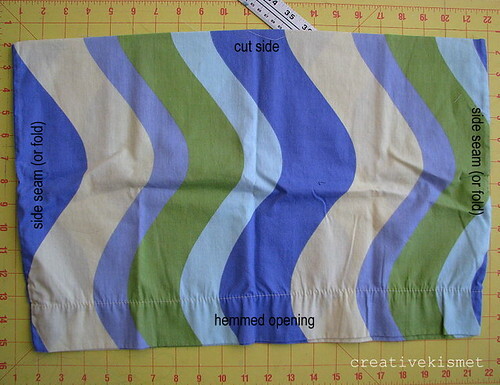 The pillowcase hem will be the hem of the short’s legs. Now cut the pillowcase in half- these are the legs. For my bigger guy, I used the whole width of the pillowcase. I cut an additional 2 inch strip off each piece for my little peanut, so that it would fit his waist better. If you want to be more specific, add 2-3 inches to your waist measurement and then divide by 4. This gives you the measurement of a quarter of your measurement, which is one leg (above) folded in half. Open the fabric piece flat, and it should measure half of your measurement. Does that make any sense? Now open the pieces flat with right sides together. Pillowcase seams are now lined up together in the center. 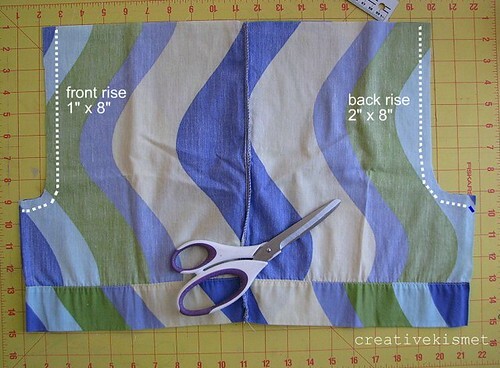 Cut the rise using your measurement (crotch to bellybutton or center waist line). If you got 8 inches, cut out a piece measuring 8″ x 1″ for the front, slightly curving around the corner for better fit. Cut 8″ x 2″ on the other side. The extra inch allows for extra bum space. Pin together and sew. I also did an overlock stitch along the edges with my regular machine. This helps keep the bum from ripping open during high action kung fu moves. Now, open piece up, lining up the front and back rise in the center with the side seams now on the sides again. Pin together and sew along the inseam -see dotted line above. Again, I did an overlock stitch along the edge for extra reinforcement. Now have your little one try them on to make sure they are going to fit. They need to be pretty loose so that when the elastic waist is in they will have extra give. If they are WAY too big, you can sew along the side seams to take them in a bit. To make elastic waist casing, iron down the top edge a quarter of an inch all the way around. Fold down another inch and iron all the way around. 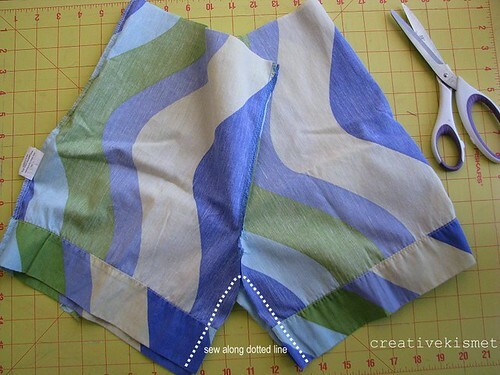 Now sew along the bottom edge, all the way around, making sure to leave an inch or two open to slide in the elastic. I used 1/2 inch elastic cut to fit around the waist. Slide elastic through the casing using a large safety pin, sew elastic edges together, then sew little opening closed. It’s probably a good idea to mark an x on the back side so the kids know which way is back. 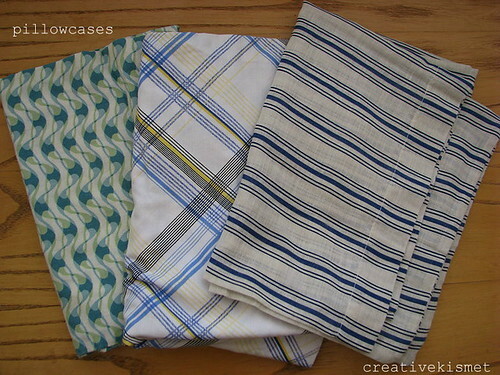 * Use the left over pillowcase pieces to make cool stuff like THIS. * Please let me know if you have any questions. We are heading out of town tomorrow!! I’ll be back later next week. Until then, I’m hoping to do a photo journal of our trip here. No words, just photos. See you on the flip side. This entry was posted in Clothing, Sewing, Tutorials, how to and tagged clothes, how to, instructions, pajama, pillowcase pajama shorts, Sewing, shorts, tutorial. Bookmark the permalink. Have a great time snuggling the baby and seeing the family. Pillowcases make great skirts and tops too. my ? Fabric U ? I love that – what a great idea! If you cut the legs a bit shorter, they could be boxers! Thats another use! Thanks! Super cute! I love making stuff out of pillowcases but all of mine are girlie. I recently made pj shorts for my boys out of old dress shirts. 🙂 I’ll have to look for some more “manly” pillowcases! So incredibly clever! I’m hitting the thrift store immediately to find some cool pillowcases. Thanks for sharing! This is four times now that i’ve landed on your website in the last 4 days when searching google for absolutely unrelated things. Kinda funny. Keep up the good work! I LOVE this idea! I have so many of my nana’s pillowcases. What a fun use for them. Thanks tons for this, I’ll be linking. Those look great! Just wondering, could you do a similar thing for women? I love this! Wish I had seen it before the weather cooled off, the boys could have used them! Bookmarked for next year I guess! What a creative idea! Makes me look at my linen closet in a whole new light! Actually, I’m trying to do the exact opposite. 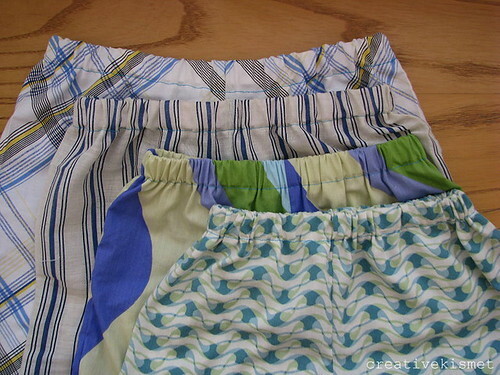 I have a few pairs of incredibly soft board shorts, and I’d like to make a pillowcase out of each pair. Any tips on where to cut and where to sew? Great,I love the creativity! I am a beginner but surely I will try this for my lil boy! You can also pick up sheets at the Thrift Store to make shorts, dresses, etc.